Magnetochemistry is concerned with the study of magnetic properties in materials. It investigates the relationship between the magnetic properties of chemical compounds and their atomic and molecular structure. This rapidly growing field has a number of applications, and the measuring and interpreting of magnetic properties is often conducted by scientists who are not specialists in the field. Magnetochemistry requires complex mathematics and physics and so can be daunting for those who have not previously studied it in depth. 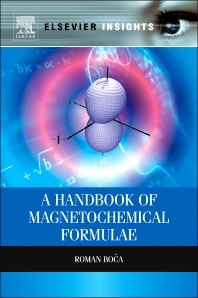 Aimed at providing a single source of information on magnetochemistry, this book offers a comprehensive and contemporary review of the mathematical background and formula for predicting or fitting magnetic data, including a summary of the theory behind magnetochemistry to help understand the necessary calculations. Along with tables listing the key formula, there is also a model of the magnetic functions showing the effect of individual magnetic parameters. The clear structure and comprehensive coverage of all aspects of magnetochemistry will make this an essential book for advanced students and practitioners.